We are more than happy to help you try to resolve any issues you have. This will avoid us opening an unpaid item case. 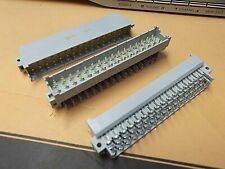 64 way DIN 41612 card edge connector - row A B. Unless specified otherwise this sale is for one item even though the photo may show more than one for illustration purposes. Plug, DIN41612, RightAngle PCB F Body 48 loaded. In this “Buy it now” you will get DIN41612 Plug 48 Way Right Angle PCB x 1 pc. Pitch Spacing: 5.08mm. Insulation Resistance:1000Mohm. Type: Power F. Insulator Material:PBT. DB37 Male D-Sub connector. Cable Type: Round. We do not accept C.O.D. orders. United States funds only. PCB through hole mounting 10 way Mini DIN screened socket. PCB mounted dual RJ45 connector with yellow & green LEDs. Manufacturer:Radiall, Air Electro. Connector Type: Aerospace Rack and Panel Connector. Connector Mounting: Panel. Part#:620-800-214, AEI 0749-01. GLENAIR M85049/87-14W02 CONNECTOR Banding Backshell 90' Size 14 Shell Cadmium GLENAIR 06324-M85049/87-14W02 MILITARY STANDARD Connector Accessories Right Angle Banding Backshell Olive Drab Cadmium Over Electroless Nickel Finish Shell Size 14 BOX 646. RIGHT ANGLE MOUNT ANGLE HEADER CONNECTOR. Make Supersized Seem Small. Get Images that. 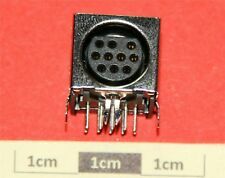 FamilyBackplane Connectors - DIN 41612. Connector TypeReceptacle, Female Sockets. Material - InsulationPolyester Thermoplastic, Glass Filled. NEW & ORIGINAL . Number of Positions96. Number of Positions LoadedAll. Plug, DIN41612, Vertical PCB (Reverse from normal) C Body 96 loaded 64 Way. In this “Buy it now” you will get DIN41612 Plug 64 Way Vertical PCB A C x 40 pcs. Pitch Spacing:2.54mm. Insulation Resistance:1000Mohm. PCB mounted RJ45 connector with orange & yellow LEDs. Part # 162-2100894. Item weight: 8gm. RoHS Compliant. 96 PIN BACKPLANE CONNECTOR. Connector TypePlug, Male Pins. AMP 650908-5. Mounting TypeThrough Hole. Material - InsulationPolyester, Glass Filled. NEW & ORIGINAL 1 Piece. Known as : DIN fully loaded Plug (Male). 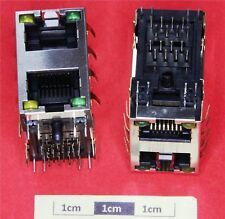 We can do other sizes of DIN connectors, Let us know what you require and we may be able to help. Rows Loaded: Fully Loaded a b. In this “Buy it now” you will get DIN41612 Plug 64 Way right angle PCB A B x 1pc. Connector TypeHeader, Male Pins. Connector UsageBackplane. Connector StyleHDM® Guide A. NEW & ORIGINAL . Mounting TypeThrough Hole. Number of Columns24. Backplane Connectors. VHDM-HSD™ Backplane Connectors. 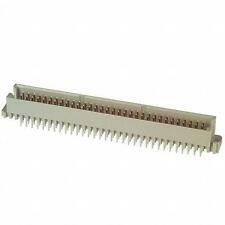 2.00mm Pitch 8-Row VHDM-HSD™ Backplane Header, Open Module, 150 Circuits. Ground Plane Shield. PCB Retention. Pitch - Mating Interface. Guide to Mating Part. Socket, DIN41612, RightAngle PCB F Body 48 loaded. In this “Buy it now” you will get DIN41612 Socket 48 Way Right Angle PCB x 1 pc. Pitch Spacing: 5.08mm. Insulation Resistance:1000Mohm. Double your traffic. PCB CONNECTOR BACKPLANE. OPEN MODULE 8 Rows 200 PIN. VHDM-HSD Connector. Condition: NEW. Make Supersized Seem Small. Get Images that. PCB CONNECTOR BACKPLANE. OPEN MODULE 8 Rows 80 PIN. VHDM-HSD Connector. Condition: NEW. Make Supersized Seem Small. Get Images that. Series : 74057. 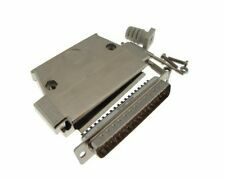 Manufacturer : Molex. Pitch : 2 mm. Number of Rows : 6 Row. Number of Positions : 60 Position. NEW & ORIGINAL . Plug, DIN41612, Vertical PCB, C Body, 64 Way. In this “Buy it now” you will get DIN41612 Plug 64 Way Vertical PCB A C x 4 pcs. Known as : Reverse DIN. 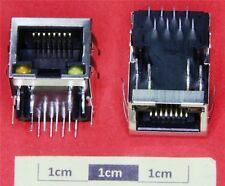 More available, we can do other sizes of DIN connectors. Female, DIN41612, Socket Right Angle PCB, C Body, 64 Way. In this “Buy it now” you will get REVERSE DIN41612 Female Socket 64 Way Right Angle PCB A C x 2pcs. Known as : Reverse DIN. of Rows:3 (2 Loaded). 940-600B-40H Amphenol XCede Plus Standard Loaded Backplane Connector - Priced for 1 connector. XCede Plus Standard Loaded Backplane Connector Lead-Offs Number. 8P8C side entry. Single port, PCB mount. Manufactured by TE Connectivity (AMP/Tyco) - Part # 1-1734795-5. Item weight: 5gm. Right Angle 5.2mm Backplane Connector. Tube of 20. 80-Pos 8-Row. 51770-009 BRG51770-009 amphenol / FCI. connector socket PowerBlade 134P (3P 128S 3P) gold 30. you are ordering a tray of 11 pieces. PCB mounting right-angle 4 pole Mini DIN SVHS connector. Extended face plate with screw thread. 23 FCI HM2R70PA5108N9 receptacle connectors. 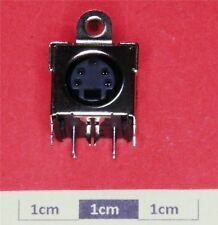 2mm Press Fit, right angle, thru-hole solder.Millipacs series receptacles, B22. It will always be described fairly and usually listed as a parts unit. We want you to keep coming back. 95-position, type B. Press fit, right angle, thru-hole, solder, 2.54mm spacing. It will always be described fairly and usually listed as a parts unit. We want you to keep coming back. After all, this is "TheHappyElectron" and we need all the "positive" we can get. (3) 110 Wall Mount kits 006-41AB2-1F5 for Circa 1880 Entrance Terminal 1880ENA1. Amphenol FCI. 175 Position Header. Male Pin Connector. Amphenol FCI. Type B Vert. 125 Position Receptacle. Tray of 36. 1pc - 10-507143-15C - AMPHENOL - CONNECTOR - NEW! Number of Rows: 5. pick the item up ?. Inventory IS06-240-243-00-06. Amphenol FCI. 125 Position Header. Male Pin Connector. Tray of 32. Manufacturer: FCI / Amphenol. Pitch: 2.54 mm. Number of Rows: 5 Row. Number of Positions: 95 Position. Insulation Resistance: 10000 MOhms. RoHS: No - RoHS Version Available. Type: Module Type B (19 Positions). AMP/ TE Connectivity right angle 128 position back plane. Manufacturer : TE Connectivity. Pitch : 2.54 mm. Number of Rows : 4 Row. AMP/ TE Connectivity 40 Pin Connector Header. Pitch - Mating0.100" (2.54mm). Connector TypeHeader. Mounting TypeThrough Hole. ShroudingShrouded - 4 Wall. ManufacturerTE Connectivity AMP Connectors. Ingress Protection-. SAMTEC TST-120-01-G-D 40 Pin Connector Header. Pitch - Mating0.100" (2.54mm). Connector TypeHeader. Mounting TypeThrough Hole. ShroudingShrouded - 4 Wall. Insulation ColorBlack. Ingress Protection-. FeaturesKeying Slot.